The majority of Bloom Into You‘s opening sequence flower language begins with lead couple Touko Nanami and Yuu Koito’s friends: Sayaka Saeki, Akari Hyuuga, and Koyomi Kanou. Koyomi and Akari are each given two specific flowers that relate to their respective relationships — in the case of Koyomi they give us more detail on her love of writing, and in the case of Akari they tell us more about her one-sided romance. 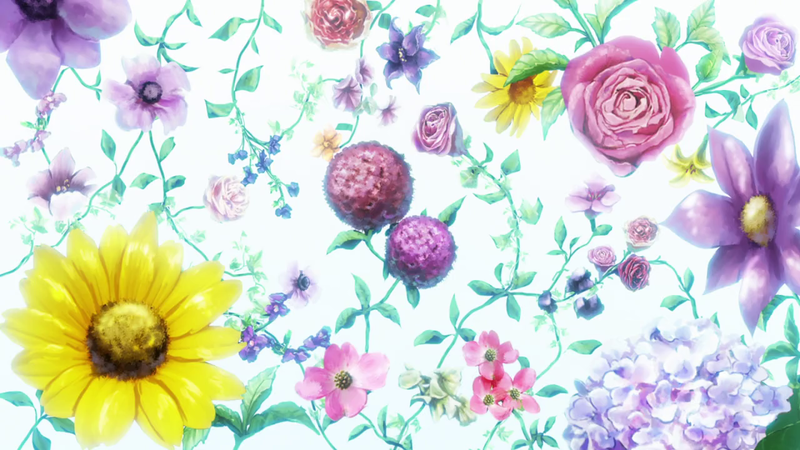 Sayaka is a bit more complex, and is shown with a wide arrangement of flowers that discuss the depth of her relationship with Touko in great detail, hinting at what might be to come from later episodes in the series. 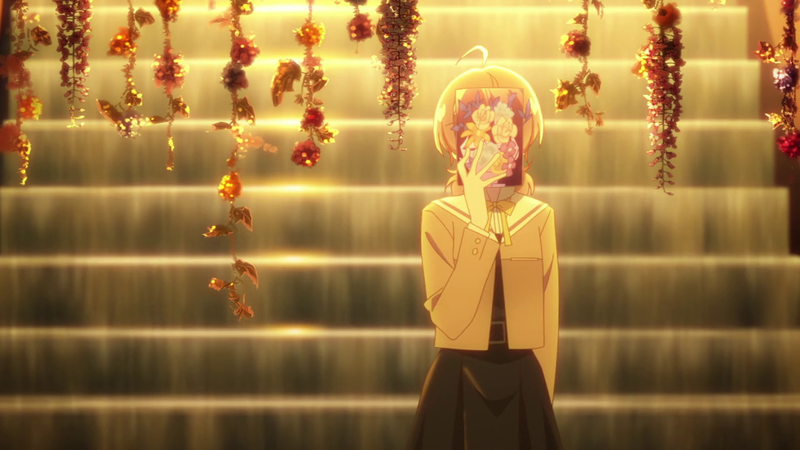 Bloom Into You makes it a point to show them first in the opening, which establishes a baseline for how we’re supposed to read the hanging flowers above the desks, petals below, and flower arrangements. In all three cases of the periphery characters (Sayaka, Akari, and Koyomi) the language of the individual flowers represent their respective emotions, but the presence of flowers, and flower petals, above and beneath their desks, represents a more general desire or love. 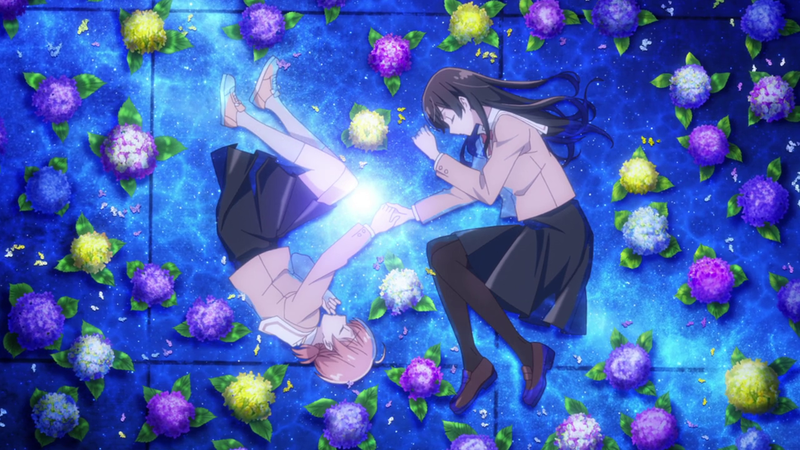 In Touko and Yuu’s cases, flowers showcase their relationship with each other as well as their outlooks on current relationships as a whole. First, we have a nod to Yuu’s current inability to feel romantic feelings towards anyone, which she sees as something that isolates her from others, even her closest friends. Sandwiched in between Koyomi and Akari, Yuu’s desk is on a carpet of blue petals or a blue shadow, but doesn’t have the hanging flower arrangements of her two friends. 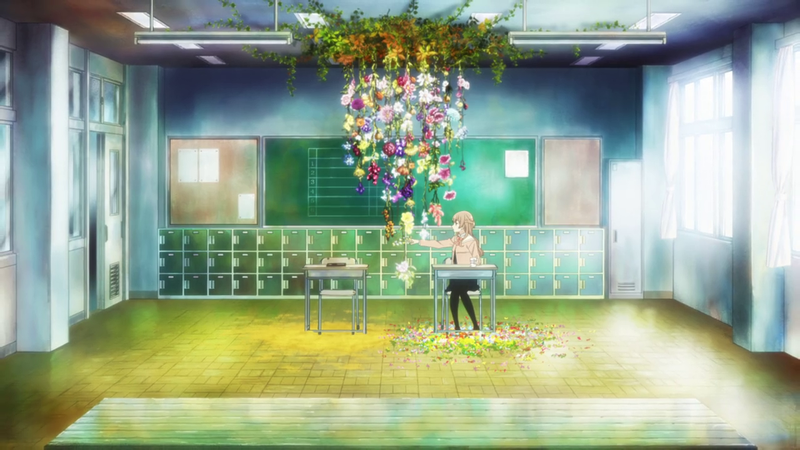 Koyomi and Akari’s relationships represented by their flowers are separate from Yuu, so their flowers hang solely over their desks and they are occupied with their own thoughts or activities. The flowers are also almost like two curtains, separating Yuu from the innermost desires of her friends because she can’t fully understand them, not being able to feel them for herself. 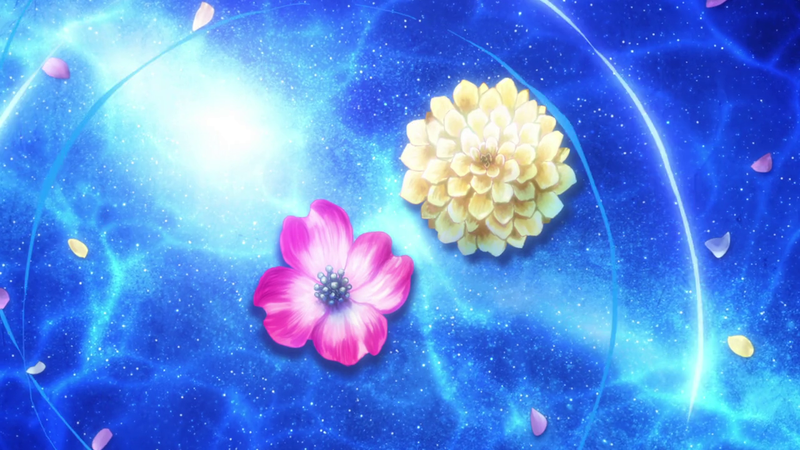 Yuu later disappears, leaving only Touko’s planetarium gift on her desk while Koyomi and Akari remain with their flowers. 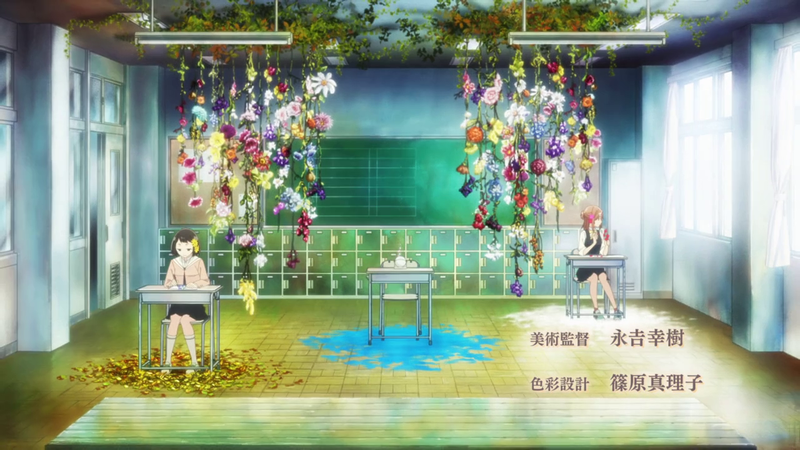 By contrast, flowers hang above both Touko and Sayaka together, but it’s only Sayaka who is in love with Touko. 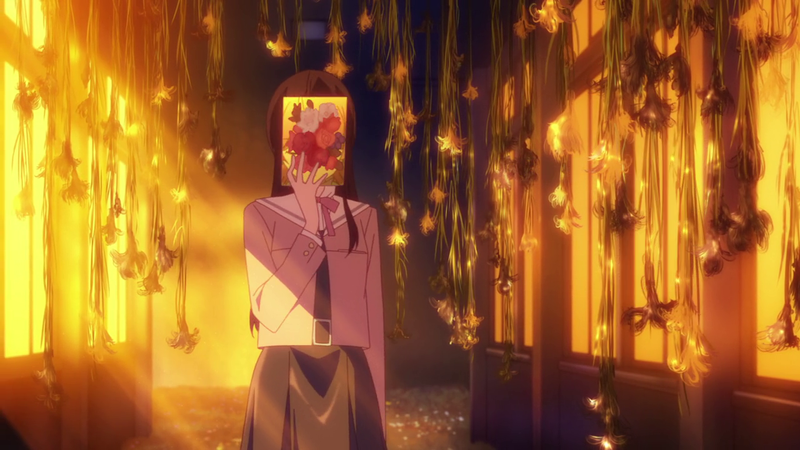 Her feelings are very clearly not reciprocated in this sequence, since she reaches out through the flower curtain and Touko walks away. Yuu then stands under a number of hanging flowers, the most prominent of which appears to be a wisteria flower. Wisteria holds many symbolic meanings in Japan, especially endurance even in the face of rejection or heartache due to the usage of the flower in an old kabuki drama, “The Wisteria Maiden.” This has also translated to immortality, longevity, heavy devotion to someone or something, or patience. Paper cranes join flower petals at Yuu’s feet, a possible symbol of hope or healing. The wisteria flower is a flower of prayer in Shin Buddhism, the most commonly-practiced form of Buddhism in Japan, meaning reflection and humility. In Victorian flower language, the wisteria took on a darker meaning of a cloying or suffocating love — a warning that a steady devotion could become an obsession. Due to the creeping vines of wisteria that hang down, wisteria was also seen as a symbol of an expanding mind or consciousness. This flower is perfect for Yuu as we know her and gives nods to her indecisive nature as well as her overwhelming dedication to something — like Touko and the student council election — once she actually makes a decision. It also hints that, if Yuu was to fall in love with Touko, she would be a very devoted partner with a significant amount of patience. Even if Yuu never recognizes or associates her feelings towards Touko as romantic, the wisteria already points to the fact that Yuu is dedicated to Touko. Touko is surrounded by what appear to be hanging lily flowers, which have a multitude of different meanings depending on color, but are most commonly associated with funeral flowers. Identifying the color of these flowers is difficult due to the lighting. The lighter-colored ones could be yellow or white, while the darker-colored ones could be purple or black. White lilies are used in yuri series to represent lesbian love as well as purity or innocence. Yellow lilies symbolize happiness and friendship; however in Japan, orange lilies can also represent revenge. Purple lilies are said to be a gift of admiration, accomplishment, and dignity. Finally, black lilies represent death, deceit, and lies. Like Yuu’s wisteria, Touko’s lilies hint at the depth and complexity of her character. Touko projects the idealized appearance of her deceased older sister Mio: confident, composed, and determined while also being empathetic and approachable. Internally, she is conflicted, anxious, and lonely. Until Yuu came along, she too hadn’t felt strong romantic feelings towards anyone, and had rejected all suitors. Her thoughts in Episode 6 — that love is a generally negative and binding emotion, and that Yuu should never fall in love with her — hint that she feels incapable of receiving love from others. Her façade makes this even more complex, since Yuu is the only person with whom she feels like she can truly be honest. 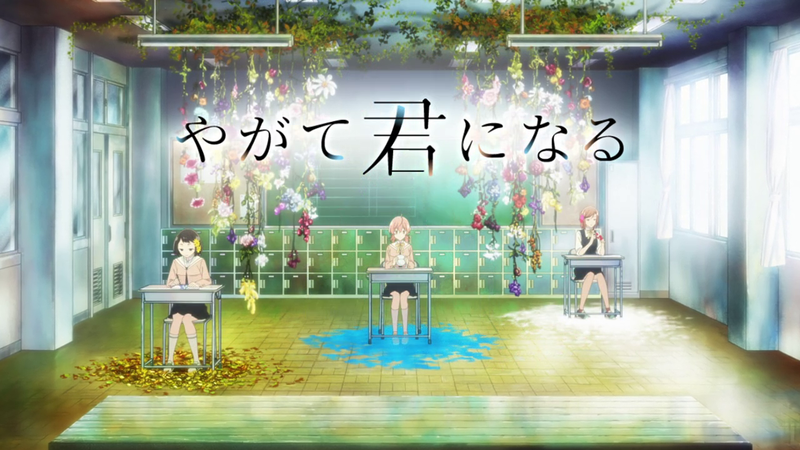 Yuu and Touko are shown together, holding hands, surrounded by hydrangea flowers of different colors. In the next scene, their bodies become vines and their faces, masks. The most common meaning of a hydrangea flower in Japan is pride and sometimes apologies or gratitude. However depending on color, hydrangeas can mean anything from turning down a romantic proposal/chastising someone for their frigid nature (blue), boasting/purity/abundance (white), wealth/seeking a deeper understanding (purple). Regardless of whether they have a negative or positive connotation, hydrangeas tell us that strong feelings are involved. Finally, Yuu and Touko disappear and are replaced by a flowering dogwood flower (also present in Sayaka’s many flowers) and a Lady Banks rose according to the author*. The flowering dogwood carries a message of rebirth and also announcing one’s affection. In this case, Yuu is turning into a dogwood flower and presumably offering herself to Touko, again suggesting romantic intent even if she doesn’t herself realize her own feelings yet. Touko’s rose is a Chinese flower named after the wife of botanist Sir Joseph Banks and is said to have the scent of a violet over a rose. A pale yellow, it could carry the meaning of jealousy in Japanese hanakotoba. Their flowers and positioning throughout Bloom Into You‘s opening suggest that Touko and Yuu’s relationship is one of deep attachment (possibly of an entire lifetime) and admiration as well as the potential for jealousy or miscommunication. 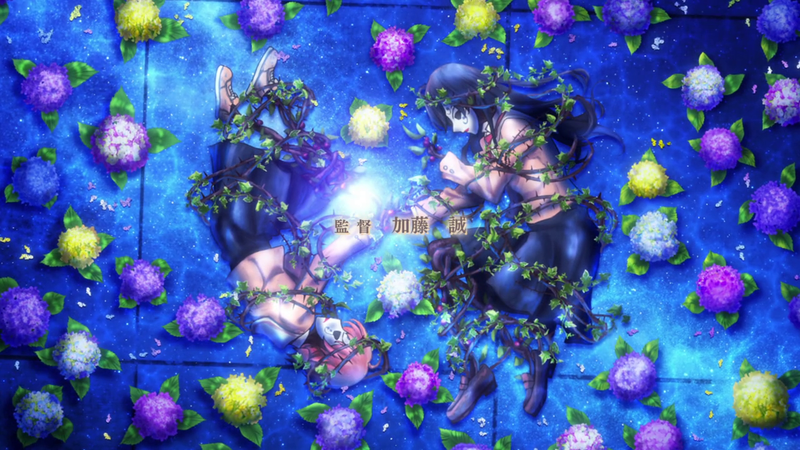 This has already been shown in small flashes throughout the anime; however, if the flowers’ messages are correct, that bond will only deepen between the two of them going forward. *In the first draft of this post, this was incorrectly identified as a yellow dahlia. Thank you commenter Sanya for the correction. Great post and really informative. Thanks for taking the time to put this together as I really enjoyed learning a bit more about the choice of flowers. Fixed! Thank you so much.